Tons of Supernatural news emerged at PaleyFest, so before the season returns for its final few episodes, we’re applying our powers of deduction and theorizing about what’s most likely in store. In the last few days, a deluge of new Supernatural press has circulated as the cast and creators prepared to take the stage at PaleyFest 2018 to premiere one of the show’s most ambitious and unusual episodes in its 13-season history – an animated crossover with Scooby-Doo. While the audience present at Hollywood’s Dolby Theatre was thrilled to witness Team Free Will work alongside the Scooby Gang in all their 2D technicolor glory, the momentous occasion also served as a mini press junket, with the stars and showrunners promoting the remainder of the season with a large number of red-carpet interviews and a few exclusive media opportunities surrounding the event itself, where they appeared onstage for a lengthy audience-participation panel, which you can watch below. 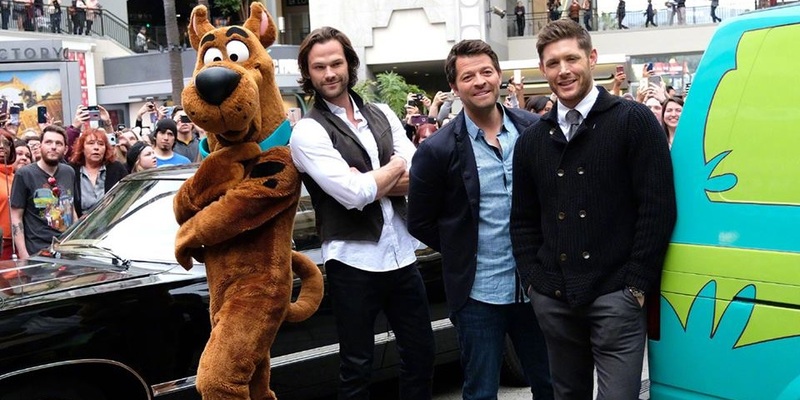 While Scooby-Doo may be the reason that Supernatural is being pushed more prominently into the general pop culture consciousness right now, those who follow the show more religiously were offered a fair few tidbits that, when matched with spoilers emerging from Vancouver as the cast films the final few episodes of season 13, make it possible to firm up a number of idle theories about the where the story is heading into genuine predictions with a bit of meat on their bones. Season 13 — though it has offered up some of Supernatural’s very finest episodes to date — has not, for better or worse, offered as clear a through-line in terms of central conflict and big bads as some of the show’s previous years. The first six episodes served as an aftermath to the carnage of season 12 — a deeply personal exploration into the Winchesters’ emotional states, character-driven rather than plot-driven, serving a very particular purpose, and the middle few episodes — including the winter mid-season finale and premiere — were dedicated to the build-up of Wayward Sisters. It’s only as we start to get into the final half of season 13 that the mission ahead truly becomes clear — though the audience has seen the set-up of it in scenes away from the boys’ story, the Winchesters have remained oblivious to how it all ties together until rather recently. And while those puzzle pieces have been becoming clearer week by week, the series has been airing very sporadically for the last couple of months — thanks to the Winter Olympics, we’ve fallen victim to more post-Christmas mini-hiatuses than usual. When Supernatural returns on March 29 with “Scoobynatural,” that’s just another disruption. Given the production needs for an animated episode, we always knew that this was going to be a totally accessible, totally self-contained Monster of the Week episode where everyone would basically be a surface-level caricature of themselves and that nothing about the surrounding arc would be addressed, because this episode was written by the Scooby-Doo team well before the Supernatural writers began to conceive the plot of season 13. However, after “Scoobynatural” we’re full steam ahead into the big stuff. No more breaks, we’re going straight through spring to the finale, which is currently set to air on May 17. So before that all kicks off, this feels like a good time to pause and consider what’s ahead for Team Free Will, and what the crux of this season might be. We’ve got all the remaining episode titles to theorize about, we’ve got a whole bunch of new interviews to draw from, we’ve got guest star confirmations from the Vancouver set, and most importantly, we’ve got the power of fannish deduction. It’s time to predict the remainder of Supernatural season 13! Dean will become an archangel’s vessel. We just received the fascinating news that Jensen Ackles is filming a significant arc in which he’ll play a significant character other than Dean for the first time. While Ackles has done small stints as another monster using Dean’s face — a couple of shapeshifters, a Khan Worm, a Leviathan and so on — he’s never done the kind of multi-character arcs that Jared Padalecki has had on his plate more than once, as Gadreel and Lucifer, not to mention a full body-swap episode just for the fun of it. 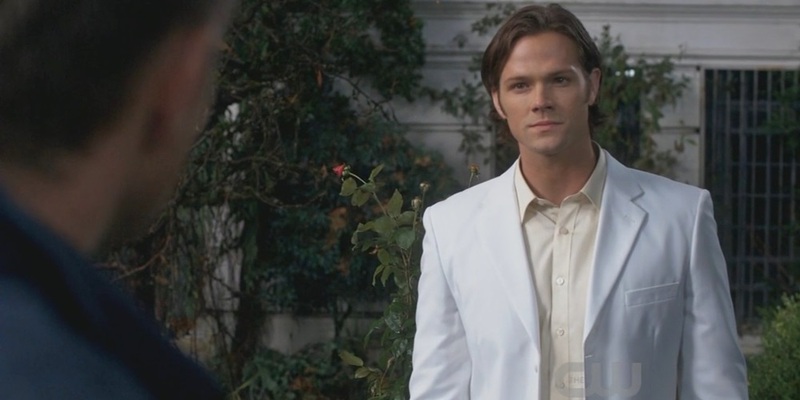 Even Padalecki’s portrayal of Sam while soulless was much more a departure from regular Sam than the differences shown in Dean when he became a demon. Even before this week’s press junket, I was going to predict that Dean would finally go head-to-head with an iteration of Michael. 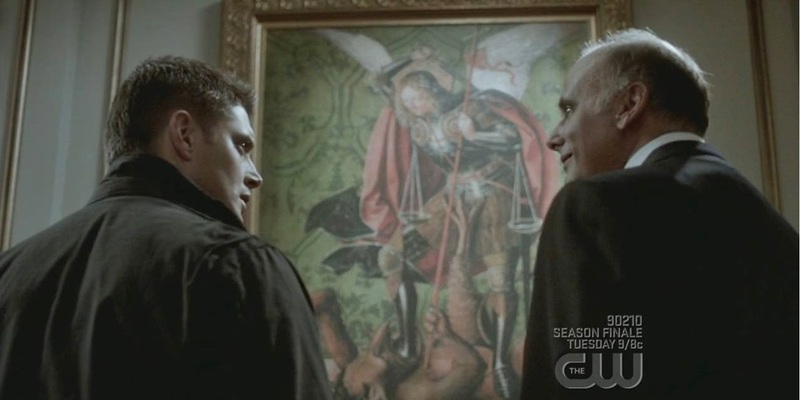 As long as Heaven interferes with humanity, Dean’s entire destiny, fought against and avoided for so long, is still wrapped up in this vessel bond, and while I believe that Free Will shall, in the end, prevail, there is still a showdown that needs to happen, in some way, between these two. Sam has had to deal with Lucifer over and over again throughout the series — including Lucifer trying to take him back as a vessel — and this season he finally addressed his trauma regarding that relationship. But Dean and Michael remain separated, and have a lot of unfinished business. Dean’s only even met Michael very briefly, when the archangel possessed his father, and I initially imagined that we’d see Dean go up against the new Apocalypse World Michael, who would also acknowledge their connection. But in light of this news, whatever Ackles has coming up, it’s big — it’s not a casual little bit of monster possession. It’s a huge deal, and it’s relevant to the ongoing story. 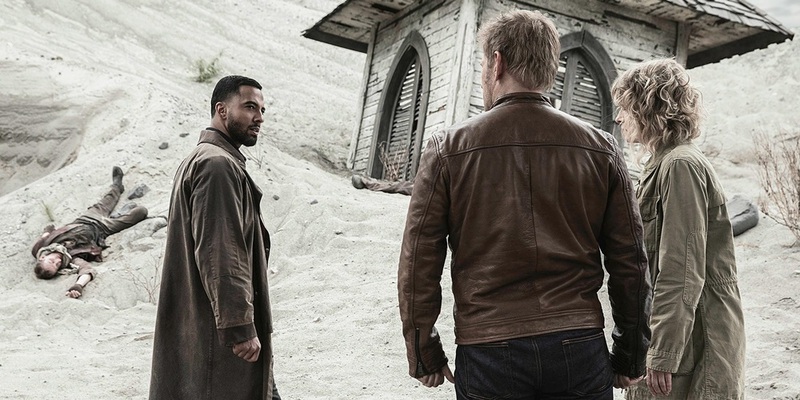 Showrunners Andrew Dabb and Robert Singer teased that it’s someone we’ve met before, many years ago, and that it’s a bold choice, a season finale-type game changer. So naturally, the first and most obvious idea here is that he’s finally going to fulfill his own destiny and say yes to becoming Michael’s vessel. But which Michael? Apocalypse World Michael — currently played by Christian Keyes — who might want to get his hands on the most perfect vessel possible and forces Dean into letting him ride shotgun by threatening those Dean loves? Or our Michael, who was last seen using the Winchesters’ half-brother Adam as a vessel, who fell into Hell with Sam and Luicfer, and who’s still around, crazy and drooling, singing showtunes in a corner of in Lucifer’s Cage? Will this be a Michael vs. Michael apocalypse showdown? Two Michaels enter, one Michael leaves? Personally, I am far more interested in seeing Ackles take on the role of our Michael, an archangel who used to be a master general and has now been tortured into insanity. The vulnerability, the erraticness — who knows, maybe he’ll finally get his Emmy. However, there are several other options for who Ackles might be portraying. 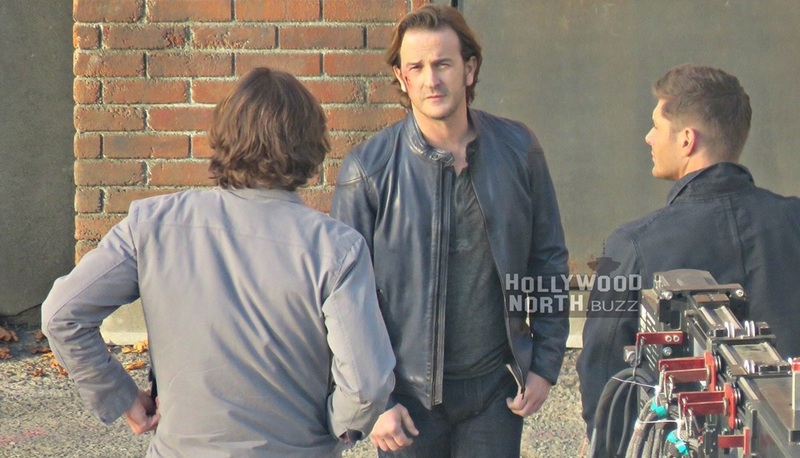 If we’re going with the whole Winchester bloodline for the archangels thing, Gabriel has, of course, returned, and his arc has been promised as significant and heroic: maybe it’s him who needs a new vessel, despite Richard Speight Jr’s recurring appearances on set. Raphael got exploded, but God did throw in a little hint that with time, he could rebuild any angel of his choosing. And then there’s Lucifer… Dean’s the only one of our leading men who hasn’t had the pleasure of being used as a meatsuit by the devil. I dread to think what turn of events could lead to this. But maybe it’s not an archangel. Singer’s comments about meeting this character years ago likely rules out the shape-shifting Prince of Hell Asmodeus. Demons don’t need consent to enter a vessel, but the boys are warded against possession, so that’s probably out, but — and this is a pipe dream I’m in two minds about — given their rather special friendship, what about Crowley? I do actually believe that Crowley is dead, and it was a good and honorable death, but what if his essence is still floating around in the Apocalypse World and he needs a helping hand? What if Dean gave his permission to be possessed by a demon and broke his own warding? Of course, it would not be the same without Mark Sheppard’s voice arguing with Dean inside his own head, so it’s extremely unlikely, but could be interesting. If you were to put money on this, though, Michael is the safest bet. It seemed too obvious at first, but he’s always sort of been the man behind the curtain in Dean’s arc. In recent seasons his useless state in the Cage has been mentioned frequently enough to remind the general audience that he exists, and the introduction of the Apocalypse Michael brings this history right to the forefront. As more and more press comes out mentioning Ackles’ new role — for example, Padalecki mentioning that he’s been anticipating this for many years – the more it seems like Michael is a sure thing, an inevitablity. The questions now are how and why? When Castiel became Lucifer’s vessel, he did it to protect Sam, who Luci was creepin’ on. Will Dean’s turn in the saddle be similar – done to protect someone else, like Jack, perhaps? Another comment from Ackles at Paley — “There’s gonna be a moment of a kind of call to arms for him. And he’s gonna make a very difficult decision,” only adds fuel to this fire. The rise of Witch-Apprentice Sam. Sam Winchester has been simmering at a slow boil for a very, very, very long time and his lid may be about to blow clean off. Over the course of season 13, we’ve seen Sam try to keep his head up when his brother completely lets go of all coping skills and falls apart. We’ve seen him try to compartmentalize his own aims and priorities while trying to do the best by others, particularly in his determined beliefs about his role in Jack’s life, that the spawn of his own worst nightmares is someone that he can both help and use. We’ve seen Sam start to unravel as his plans and his faith betray him, and his bone-deep damage has become more exposed than ever. It’s increasingly obvious that Sam is not a stable person – he just pretends to be one better than his brother does. Unlike Dean, who bleeds out all over the place whenever he experiences an emotion, Sam has a better grip on his feelings and behavior, but don’t you dare mistake that for genuine healthy self-actualization. Sam is a freakin’ mess whose been repressing his own repression for a decade, and something’s gotta give, soon. Where we left off at the end of “A Most Holy Man,” Sam was experiencing a something of a crisis. Always a character who needs to keep a big picture goal firmly in place in his mind to have something to work towards, he seemed overcome by the realistic potential that the Winchesters have no way to ever escape the burden of their lives, and once again, like he does every so often, he spoke, almost in tears, of his desire to do something to really change their circumstances, permanently. This particular mission objective is one that Sam has proven before that he’s willing to die attempting — most prominently during season 8, when he underwent the trials of the demon tablet in order to close the gates of hell for good. This would have killed him, and Dean prevents it, something that causes a rift between the brothers during much of season 9, as Dean takes Sam’s agency away from him because he can’t bear to live without him. The toxicity of their codependency — the vicious cycle of the world becoming more and more screwed up due to Winchesterial need to save one other rather than saving mankind — has been called out by many surrounding the Winchesters, and it’s actually getting healed these days, so I don’t think we’ll see a repeat of that kind of circumstance, but even Sam’s season 12 arc, working with the British Men of Letters to help permanently eradicate monsters, was tied into his unyielding hope for a better future. At PaleyFest, we learnt a few things about Sam that imply that he’s going to do something drastic in order to further the cause. On the press line, Jared Padalecki shared that Sam would be put through the ringer in a major way towards the season’s end, experiencing something that’s had the actor in the makeup chair for even longer than usual – and while he mentions “a few owies” in episode 21 leaving Sam pretty beat up, Padalecki’s vague descriptions of the circumstances his character will face do seem to hint that something more significant than just a monster-inflicted physical injury is afoot. While I don’t forsee another conflict of interest between the brothers — Dabb declares that they’re “very much on the same page” and “hellbent to get it done” once they’ve got a goal in sight, I do wonder if they may spread their resources around and pursue different avenues towards the same purpose — a metaphorical “split up to cover more ground,” if you will, and if, when left to his own devices, we’ll see Sam pop like a cork under immense pressure and head down a path yet untrodden. Season 13 has also highlighted some huge differences between Sam and Dean, including the misconceptions they hold about one another, and their choices for the best course of action. As each Winchester grows into his own man, their bond as brothers only becomes healthier, and recently, as that aforementioned toxicity dissipates, Supernatural has allowed the brothers to acknowledge those differences and accept them without it causing a break-up or a break-down. One such non-toxic conflict was, of course, the handling of Jack, which Dean eventually changed his tune on. Another was the response to losing Castiel, and another was the belief about Mary’s survival. But one important moment that’s still kind of a Chekhov’s gun is the part Sam played in unchaining Rowena’s powers. After the witch resurrected herself, she sought a book of magic that the boys possessed, on order to access a spell to unbind her full strength. Ultimately, after sharing their private vulnerabilities about Lucifer, Sam slips it to her without Dean’s approval. This didn’t cause massive drama between the boys, but I do believe that something much bigger is coming for Sam and Rowena in terms of the connection they share. Sam’s frank (and frankly overdue) discussion of his experiences with Lucifer, and his acknowledgement of his own repression, was more proof than I ever expected to get, regarding his mental state, and the last we saw of Rowena, she was successfully unlocking her power in a way that did not play as villainous in any way. As Ruth Connell is set to appear in several more episodes before the season’s end, we can assume she’s more than willing to team up with Sam once more. 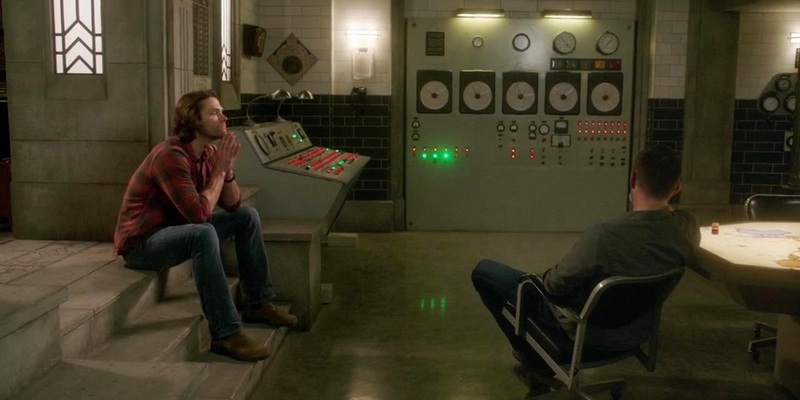 But Sam’s relationship with power goes somewhat hand-in-hand with his Lucifer-related trauma. Chosen from birth to be the vessel for Satan, cursed with paranormal powers that he believed marked him as dirty and impure, Sam has always had a difficult time accepting power, as he seems to assume it will corrupt him. This extends even to leadership and control – even though he’s a natural leader, and an utter control freak, he’s willing to hand over the reins because he’s scared to call the shots himself — scared of what he might become, and scared to be entirely responsible in the face of failure. This isn’t the most unfounded fear — we’ve seen what Sam can get like when he becomes single-minded. But that very fear signifies that this is what he needs to tackle. Much like Willow at the end of Buffy the Vampire Slayer, Sam needs to embrace and become empowered by the qualities and abilities that he has always run from in order for his character arc to be complete. He needs to own his power, whether that’s in a leadership way or an actually supernatural way. Onstage at the panel, Padalecki also discussed another issue that Sam has always struggled with – the inability to see his heroism as worth anything at all while failures still occur. Sam will always focus on the losses rather than the wins, so if there’s a way to put an end to the whole thing, Sam is going to take it. Given these hints from Paley: that Sam will throw himself into the fray and hurl all that he’s got at it, and that he’ll undergo “trials and tribulations” that lead to some significant physical changes; given that the steps of his journey — while still working together for same purpose — seem slightly divergent to Dean’s; and given that he’s formed this bond with Rowena, addressing his trauma in a way he never has before, and allowing her the key to her empowerment, I’m predicting — or maybe just praying — that we’ll see Rowena work with Sam on unleashing his own power to take down their abuser Lucifer, to raise Crazy Michael from the Cage for Dean, or to perform the huge, world-ripping spell the brothers are currently collecting ingredients for. Rowena has taught many young witches before — sometimes for rather nefarious or exploitative purposes — and has worked magic with Sam more than once. Magic is also something that we’ve seen both hunters and Men of Letters use to their advantage, but Sam isn’t a full-blown witch with innate natural power. But what if he could be? What if he should be? It won’t be easy, but what a wonderful thematic mirror to the start of the season, to see Sam mentored in accessing power in the way he started out mentoring Jack. Of course, this has the potential to go darkside. Something about this experience is, according to Padalecki, going to be a “harrowing and terrifying” experience for Sam — perhaps an ordeal to access a level of power or a needed tool, or perhaps a magical battle where he’s out of his depth — but if he prevails, it could also be a massive step towards growth and freedom for such a tightly bound character. The biggest surprise return is yet to come. One huge factor of Supernatural’s alternate universe development is, of course, the ability to bring back some version of beloved characters who have died in Sam and Dean’s world. This potential has been teased and discussed since last summer, when we saw Jim Beaver return as a Bobby Singer with some very different life experience, in the season 12 finale. Throughout season 13 we’ve seen quite a few familiar faces — or new faces for familiar characters — including, of course, Bobby, a new Michael and Zachariah, and Osric Chau as Kevin Tran. In the real world, we’ve been treated to the return of old faves Missouri and Gabriel, as well as, of course, the unkillable witch Rowena and psychotic British Man of Letters Ketch. It looks like we might soon see another nasty angel you might remember. 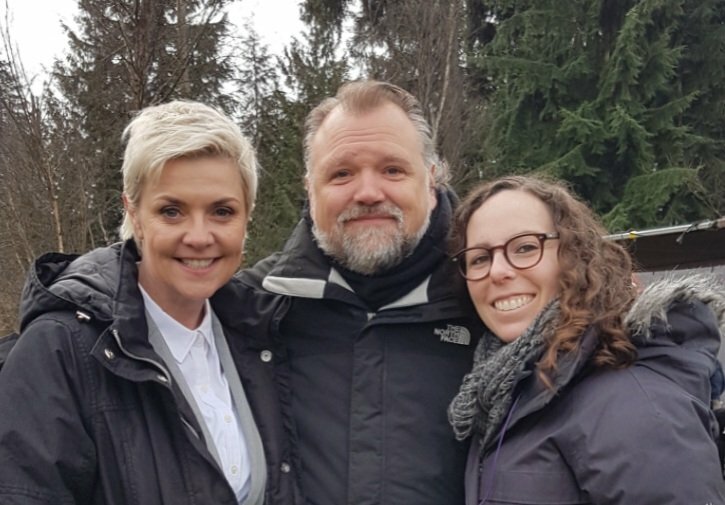 Amanda Tapping, who played Naomi, has become a regular director for Supernatural in the years since her character’s death, was most recently behind the camera for the last episode pre-hiauts, “A Most Holy Man,” however she was photographed on set much more recently, during the production of episode 19, “Funeralia,” written by Steve Yockey and directed by Nina Lopez-Corrado. Tapping does live in Vancouver, so this could have been just a casual visit, but there’s a good chance she’s appearing in the episode, as she was dressed in a rather formal outfit that looks very similar to most angels’ standard business suit costume. Naomi’s role was especially important to Castiel, as she brainwashed him into attacking Dean, and seemed to hold many as-yet-unrevealed secrets about the multitude of times throughout history that Cas has been rebooted into compliance. And that raises another question — if there’s an AU Michael, and and AU Naomi — is there an AU Castiel? Could we meet him? What vessel might he use? Gabriel himself was, admittedly, a real zinger. Supernatural pulled a fast one on us there, and they deserve all the kudos for it. The character, who initially appeared as a trickster god and was eventually revealed to be an archangel who ran away from his family and duties, was under-used in his time on the show and has risen massively in popularity since then, partially thanks to actor Richard Speight Jr’s indelible presence in the fandom, both on the Supernatural convention circuit and behind the camera as a director. There’s a lot worth exploring with Gabriel, and that’s all on the way. At PaleyFest, the writers and showrunners confirmed that Gabriel’s arc would be substantial, redemptive and heroic, and the stars shared that their characters will be thrilled to have him onside as an ally in the conflict ahead. As far as shock returns go, they’ve already outdone themselves and exceeded many fans’ wildest dreams. 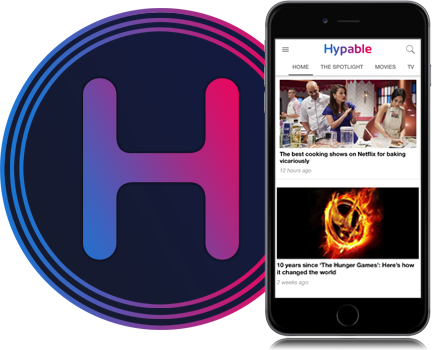 But even bigger surprises may be in store. I’m both hoping and predicting that before the season is done, we’ll get another huge appearance, someone who’s been smuggled onto the set and filmed in absolute secrecy, who we won’t get a single hint about until the second they pop up on screen. And while there could be endless options, I’ve narrowed it down to the three that I think would hit the audience the hardest. 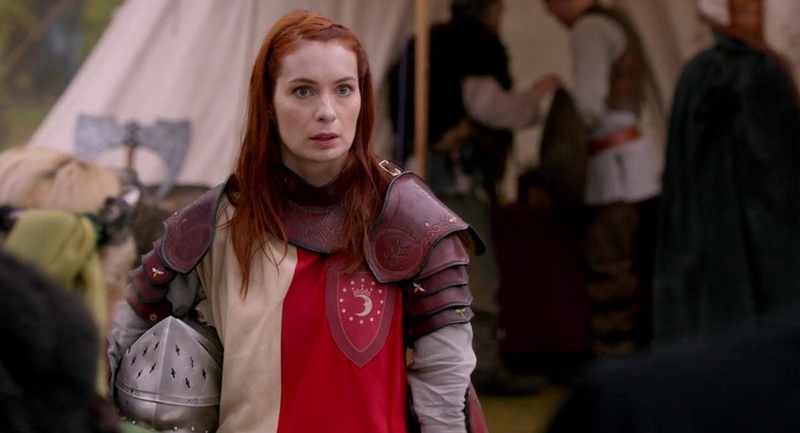 The first would be Felicia Day as Apocalypse Charlie. Charlie’s untimely death was a turning point for Supernatural in terms of how far they can push the audience. The enraged response to Charlie’s murder really seemed to sink in, to those at Supernatural HQ, as more than just fans upset about a fictional story — it had wider social and moral consequences. Since that incident, the show has really turned a corner, and uses death — particularly female death — in a very different way now. It still has its egregious moments, but on the whole, there seems to have been a responsible worldview shift behind the scenes, and the show is stronger for it. Anyway, the point is, the ultimate redemption for killing Charlie would be to bring her back, and she’d be a very interesting character to explore in terms how someone with her same basic personality and interests would develop in a completely different circumstance. Charlie’s return would probably make a lot of people very happy. My next prediction would be a gutpunch and a half, but a better story — and one even more personal to the Winchesters. I don’t know about you, but I’d personally like to get utterly destroyed by seeing Sam come face to face with another Jess, especially a badass Furiosa-type rebel leader in the Apocalypse World camps. Adrianne Palicki has a ton of stunt combat experience, and given the power that Supernatural has granted back to Mary Winchester after her origins as a burning nightgown, it would be perfectly honorable to grant Jess, whose fate has been inextricably linked to Mary’s since in the pilot, the same kind of unfridging, even if it’s something we only spend a moment or two on. Of course, this Jess wouldn’t have a clue who our Sam was, which makes it all the more delicious. Talk about Sam being ready to blow up… the shrapnel from a bomb drop like this has the potential to fly far. Of course, it’s unlikely that the Winchesters will enter the Apocalypse World again before the finale, but if we’re digging into Sam’s buried trauma, there is no better living ghost for him to encounter. Oh, the angst! There’s one more surprise guest that I believe the show has been intentionally building up to: Chuck. The lack of God’s presence has hung heavy over the show since his reveal in season 11 — knowing who he is, and knowing his impotence and his apathy, makes the Winchesters’ plight feel all the more unfair and all the more futile. Season 13, which has delved so deep into faith and the lack of it, feels specifically shaped to reintroduce God at some point, from Dean’s enraged private prayer behind Pirate Pete’s Jolly Treats in the premiere, to Jack’s investigation into his own family tree, the reintroduction of Donatello, through to the entire premise of “A Most Holy Man,” in which I felt God as the elephant in the room so strongly that I legitimately expected him to pop up at the end, unseen by the brothers. I even started theorizing that the woman Dean starts to flirt with in that episode — a strange interaction because it goes nowhere, and therefore feels shoehorned in for no discernible reason – might have been a plant for later, that she was Chuck in a new body… that’s how inevitable his return seems. As circumstances escalate with the apocalyptic archangels from multiple dimensions waging war, Lucifer trying to take over Heaven, and the young nephilim whose power, known to be greater than his father’s, must be second only to God himself, it seems like the ultimate set-up for Chuck to reappear. When? I don’t know. It feels overdue already, even if his appearance only serves to prove his lack of worth once and for all. At PaleyFest, the show’s next season, which will contain its 300th episode, was soft-confirmed — no network pickup, but everyone is planning for it like it’s a sure thing, and contrary to many assumptions that Supernatural would wrap up next year, on its 300th episode, the cast and creators are now singing a different tune and outright recanting that potential end date. No one is ready to go home yet, and while that’s great news, there is only so long the Winchesters can go on knowing that God is out there and that he’s a jerk, leaving his omniscient responsibilities on their mortal shoulders as they bounce, as Sam recently bemoaned, from one apocalypse to the next. At the moment, unless Supernatural really will run forever, it seems like that the season 13 finale, titled “Let The Good Times Roll,” will set up show’s very final arc — an arc that may take two or three seasons to resolve, but the beginning of the end nonetheless. We’ve got Dean finally merging with Michael, Sam potentially stepping up to the plate as a paranormal power hitter, we’ve got archangels on the brink of a multidimensional war, and we’ll likely see one side busting through to the other as the season’s cliffhanger. 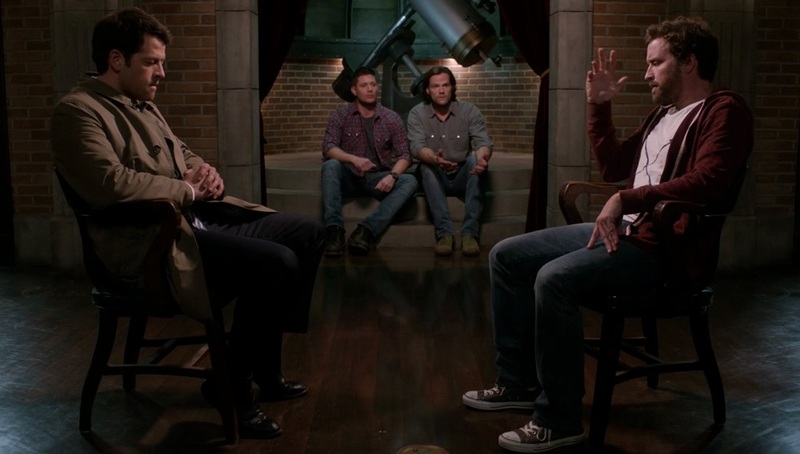 On top of all this, the Winchesters have received firm instructions from Billie — that is, Death — regarding how this messing around with different worlds will bring the universe down around their ears like a house of cards, and we know that the boys still have an unknown, fated job to do, on a cosmic scale. Chuck is going to have to show his face before the very end — but to me, it feels like the space is being carved out for him right now, and when he does pop up, I very much hope that someone — preferably a short, gold-eyed, candy-loving someone — has some strong words to lay on him. In the meantime, though… Scooby Snack?